Dinesh and Ila Paliwal have donated $1.5 million to Miami University’s Farmer School of Business to create the Dinesh and Ila Paliwal Innovation Chair and the Dinesh and Ila Paliwal Scholarship. 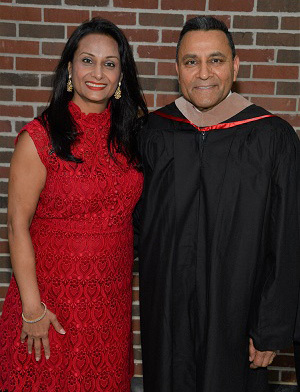 Dinesh Paliwal, president and chief executive officer of Harman International, earned master’s degrees in both applied science and engineering and in business administration from Miami University in 1985. “Dinesh is perhaps one of the most successful graduates of the Farmer School. He is certainly one of the most humble, quick to credit everyone else for his business and personal success,” said Matt Myers, dean of the Farmer School of Business. Paliwal addressed Farmer School graduates at this year's divisional recognition ceremony. “He serves on our Business Advisory Council, and when he meets with our students and faculty, the love he has for the university and the Farmer School and the passion he has for supporting others are clear. These tremendous gifts will help to ensure that the Farmer School can continue to attract and retain world-class faculty who share his passion for teaching others and that a Farmer School education is financially within reach of deserving incoming international students.” he Dinesh and Ila Paliwal Innovation Chair will recruit and retain an outstanding faculty member to provide intellectual scholarship and leadership in technology, innovation and entrepreneurial thinking. The tenure-track, full-time Farmer School faculty member will foster thought leadership and promote problem-solving skills to prepare undergraduate students to enter the global marketplace. The Dinesh and Ila Paliwal Scholarship will focus on the recruitment of exceptional international students who have demonstrated academic excellence, community engagement and a passion for innovation. The gift is part of Miami University’s Match the Promise scholarship initiative, which provides a university match to eligible new scholarship funds. “Ila and I are so excited to help inspire the next generation of leaders at the Farmer School to love learning as much as we do, to take bold risks and to develop a global mindset that inspires their creativity and leadership,” said Dinesh Paliwal. Dinesh Paliwal recently received the 2017 Ellis Island Medal of Honor, presented by the National Ethnic Coalition of Organizations. Since its founding in 1986, the medal has been officially recognized by Congress as one of the nation’s most prestigious awards. In addition to the HARMAN Board, he serves on the boards of Bristol-Myers Squibb and Raytheon. He is a member of the CEO Business Roundtable, the U.S.-India Business Council (USIBC) and the U.S.-India CEO Forum, and serves on the corporate advisory boards of The John F. Kennedy Center for the Performing Arts, the Wilson Center and the India Business Advisory Council of the Lincoln Center. Ila Paliwal is a classically trained Indian vocalist whose latest album, “Navaratna,” is internationally renowned for its technical merits, thematic interpretation and originality. She performs around the world at the most prestigious venues such as The Kennedy Center and Carnegie Hall. She works with local organizations to promote Indian classical music in the U.S. and regularly hosts visiting artists. The Farmer School of Business is a premier undergraduate business school supporting nine majors and 15 minors. Renowned for its emphasis on undergraduate teaching and the success of its graduates, the school places emphasis on experiential learning, international study and leadership development to prepare students to become leaders in the workplace and the community.